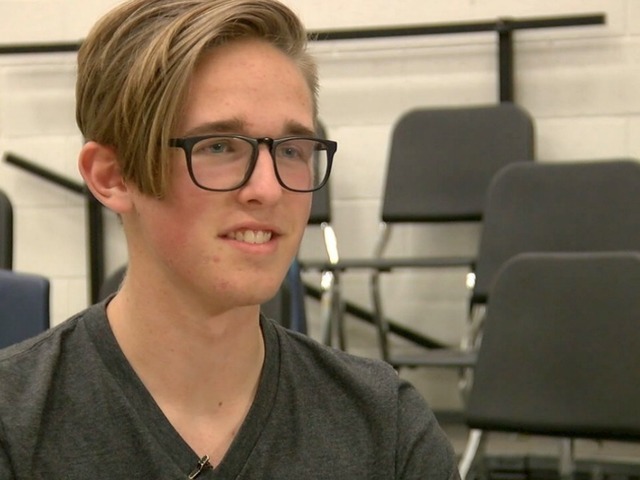 PHOENIX - A true team effort helped save the life of a Basha High School student who went into cardiac arrest. Nathan Carpenter, 17, is now back at school. Around 2:55 p.m. on November 29th, 2017, he collapsed after school while auditioning for a play. "It's totally random," he said. "I haven't done anything crazy enough to...interfere with my heart to even think that this would happen." A student flagged down JROTC Instructor Michael Cullum, who ran into the room and started CPR. "It was obvious looking at him that he was not getting oxygen to any of his extremities," Cullum said. The school nurse then entered the room and, after seeing Carpenter's condition, called for a staff member to go and get the AED. "This (was) not what I thought I was coming to," nurse Lynn Clark said. "We don't have 16-year-old boys collapse in school." As the AED arrived, so did another JROTC instructor, who pitched in as well. The AED shocked Carpenter once, and as paramedics arrived, his pulse returned. "The more people you have CPR trained, the more likely, in any environment, you're going to have somebody who's available," said JROTC Instructor Clifford Stansell. The response also brings about several coincidences, if you want to call them that. Carpenter likely would have been home alone if he hadn't stayed after school for the audition. The nurse, and both ROTC instructors had nearly left for the day when the incident occurred. "I'm not intuitive enough to know when God is talking to me, but when I (walked) out the back door and went 'Oh, now I get it," Cullum said. Nathan's family is extremely grateful to the responding staff, as well as the Gilbert and Chandler Fire Crews.